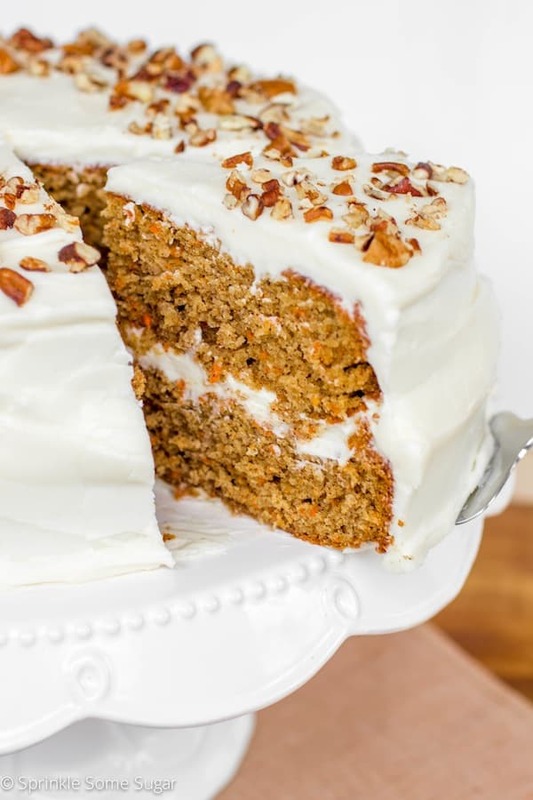 This carrot cake is extremely moist and flavorful with a hefty coating of my favorite cream cheese frosting! Easter is one of my favorite holidays. There’s just something about all of the pretty pastel colors, the dying of Easter eggs, the family getting together – everything about it makes me so happy! The most important part of any Easter get together – besides remembering what the day is really about – is the food! Mike’s parents have it every year at their home and dessert is always my thing (obviously..). The past few years I’ve brought carrot cake because it’s mike’s mom’s favorite and since it’s kind of a tradition now, I’m bringing it again this year. But this time, I have a brand spankin’ new recipe! Basically what I did was re-vamp the old one that was posted last year on this little old blog, making it even more flavorful and more moist than ever. Sounds like a sweet deal, right? Plus, those pictures very and I mean VERY overdue for an update. *cringe* This recipe is a new and improved version. 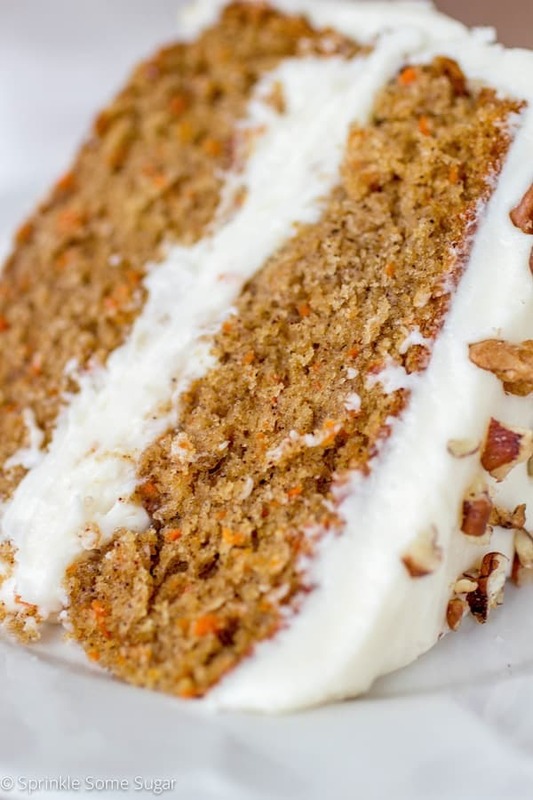 This carrot cake is to. die. for. It’s super moist and all of the spicy flavors are incredible. 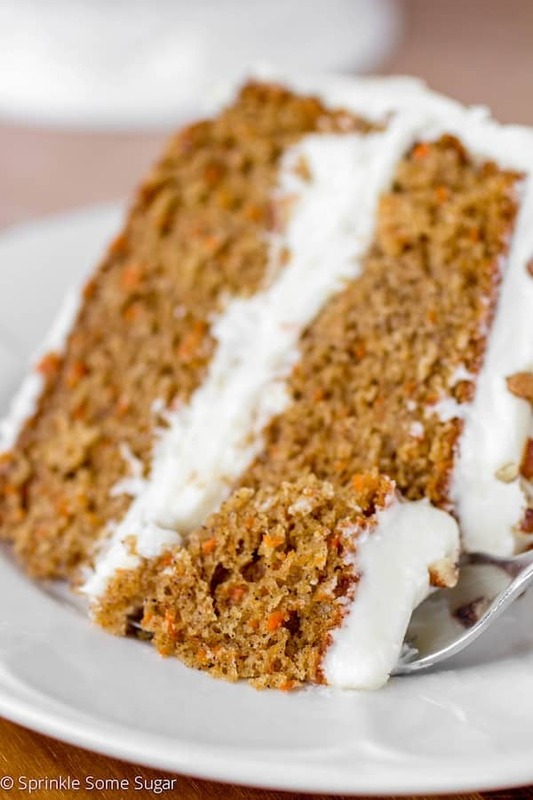 The spiciness combined with the slight sweet notes from the carrots make this cake absolutely divine. And it’s even better the next day! Think: banana bread. Once you get all of the delicious spicy flavors together and let them marry over night, they become super-charged and the cake is even more moist on the second day. 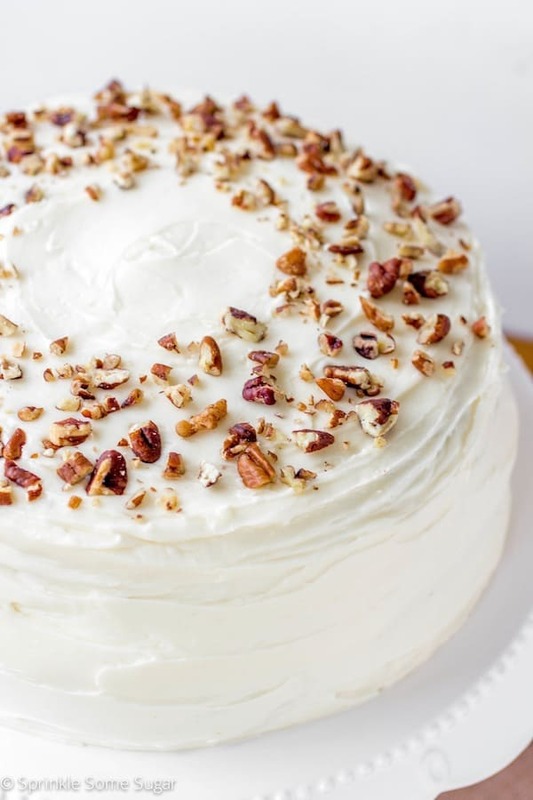 What is carrot cake without cream cheese frosting? 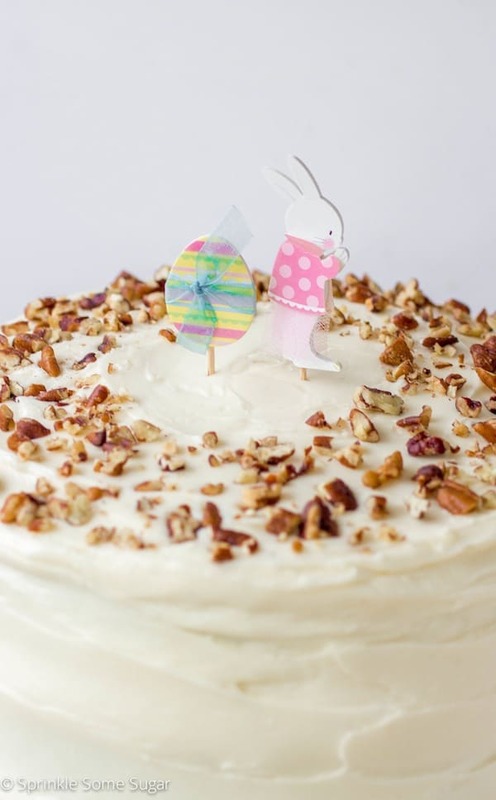 Or a better question.. What is Easter without carrot cake? This frosting is my all-time, most favorite cream cheese frosting ever, it’s the only recipe I use! Cupcakes, cookie cakes, brownies, you name it. For layer cakes I use the recipe as-is. For cupcakes or anything requiring a smaller amount of frosting, I halve it. Easy peasy! It’s not overly sweet but has a perfect balance. I think carrot cake is best in it’s purest form without all of the mix-ins like chopped pecans or raisins. Just give me tons of cream cheese frosting and I’m set! ^ By the way, how CUTE are these little Easter toppers?! I’m not sure exactly where they are from, they’re mike’s mother’s, but they just kill me with their adorable-ness. Have I made you fall in love yet? This will be my favorite carrot cake recipe until the end of time and I just know you guys will love it just as much as my family does! Preheat oven to 350 degrees. Line the bottom of two 9" round baking pans with parchment paper and lightly grease and flour the sides. Set aside. Whisk the flour, granulated sugar. brown sugar, baking powder, baking soda, cinnamon, nutmeg, cloves and ginger all together very well. Make a well in the center and add oil, eggs and vanilla. Beat the batter until just combined but smooth, don't over-mix. Fold in the grated carrots with a rubber spatula or spoon. Batter will be thick, this is okay. If you are adding pecans or raisins, do so now. Distribute the batter evenly into prepared baking pans. Bake for 30-40 minutes. Start checking cake at 25 and check every 2 minutes after that (everybody's oven is different). They are done when a toothpick inserted into the center comes out clean. Allow them to cool on wire rack for 20 minutes and then invert them onto the wire rack so they can finish cooling completely out of the pans. While they are cooling, prepare the frosting. Beat the cream cheese and butter until smooth with no lumps. Add in the vanilla and mix until smooth. Add in the powdered sugar 1 cup at a time on low until combined. Whip frosting for another minute or so until smooth and creamy. Once cakes are completely cooled, cut the tops off of the cakes so they are level, if preferred. Place one cake on the bottom of a cake stand, facing up. Spread a good amount of frosting on top until completely covered. Add second cake, bottom up, and frost the rest of the cake. I found it much easier to do one thin layer of frosting, set it in the fridge and once it firmed up a bit, add another thick layer - the frosting looks much more even this way. This cake is even more moist and flavorful the second day once the flavors have all settled in with each other. Enjoy! My Favorite Homemade Carrot Cake will stay fresh for up to 5 days stored in an airtight container at room temperature. I want all of this carrot cake. It looks so moist and textured. I hope you have a lovely Easter. Those cake toppers are too adorable. Thank you, Erin! You have a great Easter too! You can make this cake in ONE 9×13 rectangular pan or TWO 9×9 square pans. Hope this helps! Yowza, that is one gorgeous carrot cake. This cake is GORGEOUS and so thick, yummm!!! Jessica, that is one beautiful cake. I can literally taste it through my screen. Your photos are beautiful and you’re making me HUNGRY!! Haha, thanks so much Sara!! Those layers!! Wow! 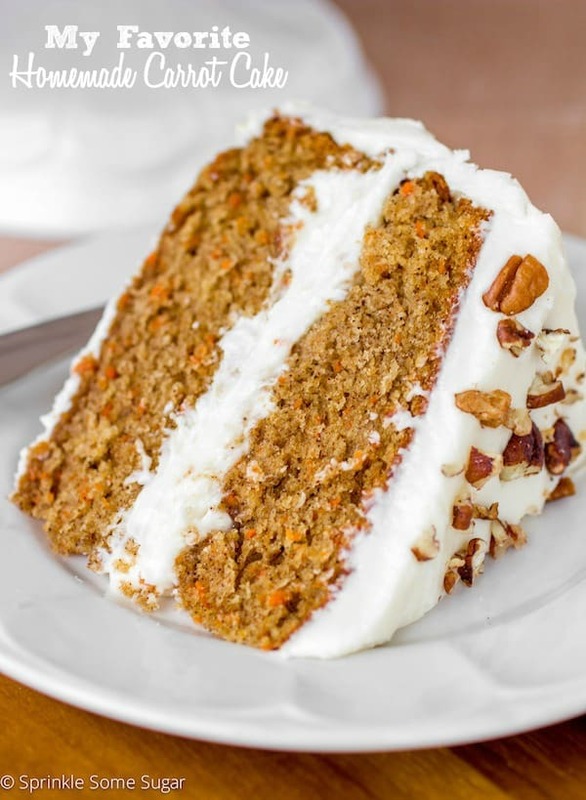 I love carrot cake, it is my all time favorite! Pinned! Jessica, THIS CAKE! Oh my word. Where is my fork, because I need to dig in! YUM! I love love love carrot cake, it’s the BEST!! Yours looks gorgeous! Carrot cake really is the best. Thanks, Jenn! Yum, look at those layers! This looks amazing. Have a happy Easter! I must try this cake! I love carrot cake, but we almost never have it. This.must.change. Yes, they are both ground. Let me know how it comes out for you, I hope you love it! Isn’t 8 cups of confectioner’s sugar a lot? I added 3 1/2 cups and I feel like it was way too much sugar. Most recipes for cream cheese Frosting call for 2 cups. Nope! It does seem like a lot of sugar, but since this is a layer cake, you are essentially doubling the cream cheese frosting. With all of that cream cheese, you need all of the sugar in the recipe to get a perfect texture. You made this exact recipe and only needed 3 1/2 cups of sugar? Do you maybe like a runnier frosting? I prefer a spreadable frosting, which is what this recipe yields. It’s all about personal preference! The recipe for the icing is WAY too much, I could ice more than 2 cakes with all this icing!! I want 2 bake this cake for Thanksgiving but I have 8″ round pans, how long would the baking times be? Baking time will be around the same, poasibly a few minutes longer. I’d watch the cakes to be sure. Hello Jessica, This recipe is what I am looking for (without pineapple) but could it be made in a 23cm x 23cm (9″ x 9″ tin) to cut into pieces for a function? Fay (Queenslad. Australia). will this cake freeze well? I had a carrot cake request for a wedding cake, and was wondering if it can be in the freezer for 4 days? I have not tried freezing this cake myself, but I don’t see why not.